“How about buying me a drink? 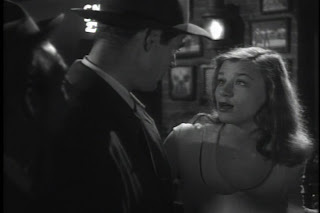 I’m all dry,” says a teen prostitute near the beginning of “On Dangerous Ground” (1951) as she looks detective Jim Wilson up and down (with an emphasis on the down). “How old are you,” he asks. 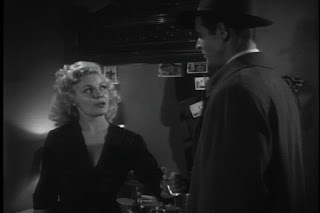 “Old enough.” That’s when I knew I was watching a film noir by Nicholas Ray. Sure, it could have been by Samuel Fuller, but few other directors in the early 50’s had such a dark outsider status and flagrantly anti-code attitude. Sadly, Ray will always live on in the popular consciousness solely as the creator of “Rebel Without a Cause” (1955), a film that has always felt overrated to me, especially in light of the director’s stunning career. While casting about for some noir to watch off Netflix, I found “On Dangerous Ground” and couldn’t resist. Any noir by Nicholas Ray is likely to be interesting, probably unusual and certainly riddled with psychological angst and agony. Jim Wilson (Robert Ryan) is a big-city cop whose life on the beat has worn him to the emotional bone. Without family and increasingly alienated from his coworkers, Jim applies himself to his work single-mindedly, though without satisfaction. While he rummages around for clues on a cop-killing case, the audience can see the frustration pooling in the recesses Jim’s face. He is hated by the public despite his ‘protection’ of them and finds little solace within the department which is busy distancing itself from his brutal, bullying methods. Wilson’s contempt for the criminal scum he has to mop up leads him stewing in rage and disillusionment. "Garbage, that's all we handle, garbage," he declares. In a scene later borrowed by the Coen brothers for “Miller’s Crossing” (1990), Jim Wilson confronts Bernie, a crook with a clue behind his sealed lips. A few ruptured organs later, Wilson knows the location of the cop-killer, but needs a place where the police chief can keep him out of the public’s attention. Our dour lead is assigned a case up north, in a snowy nowhere of rural fear and isolation. If you’ve seen “Insomnia” (the versions from either side of the ocean leaned strongly on this material), then you know that no detective ever gets a calm and restive vacation out of an exile to the artic wasteland. 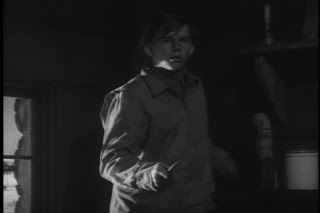 Jim Wilson is no exception, and the quick manhunt soon places him in the awkward position: spending the night in a secluded house with only a trigger-happy relative of the deceased, a beautiful blind girl named Mary (Ida Lupino) and possibly her brother, the killer. [SPOILERS] The lonely cabin makes for an excellent climax and the friction between justice, revenge, romance and redemption is palpable. The brother/murderer is a classic Nicholas Ray criminal: young and misguided. His psychological turmoil makes him strangely sympathetic. Wilson, finally dissuaded from his blood-thirsty brand of crime-fighting, spares the boy, but must then contend with the victim’s retribution-bent pa. The boy tries to flee and accidentally dies during the final chase. Mary forgives him and it appears that Jim will move in and become her new guardian, assistant and lover, but in a tragic twist of fate the minor’s death is ascribed to Jim’s over-enthusiastic methods and he is jailed for life. Not really. That is how the movie should have ended, or at least one idea that could have improved it. In reality, Jim simply returns to Mary after her brother dies and the two live happily ever after. 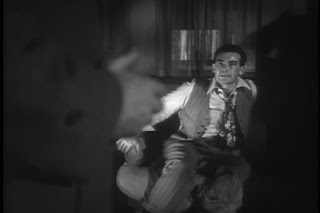 The film’s ending largely undermines its impact and seems out of place both within Ray’s canon and the film noir tradition. While neither of these things are inherently a problem, the mismatch with the style and themes of the movie make the ill-fitting ending a major gripe. 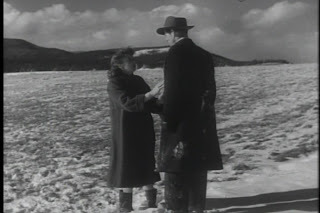 Jim’s fatalistic self-destructive spiral, the aborted intimacy of the lovers set against a bleak tundra and the dark, momentous score have all cued us for an entirely different conclusion. One can’t help think that the studio (RKO) mandated the feel-good wrap-up. 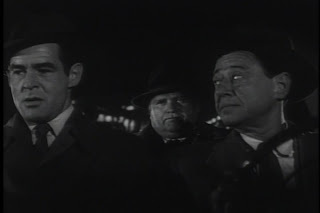 The acting is all around pretty solid, with Robert Ryan serving as the convincing, if not particularly engaging, anchor. 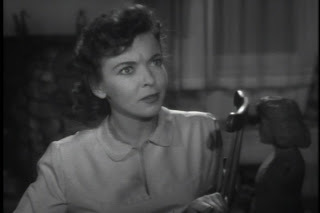 Ida Lupino (herself a talented director) gets to play one of the most vulnerable and sweet roles in a noir, a welcome break from scheming femme fatales and underdeveloped good girls. It isn’t hard to see why Jim Wilson would fall for her after his experience with the bruised and rouged ‘dames’ of the city who spout amazing quotes such as, “I like to stink myself up” (referring to an ample perfume collection). Hint 1: Note the necklines. Hint 2: Note the clothing colors. The problem lies in the interaction between Jim and Mary. The beautiful blind girl feeling the face of the hard-cut brute and falling in love with his inner knight is too familiar to an audience of today. Their budding love involves far too much dreamy gazing and saccharine promises. It doesn’t allow for genuine emotional connection and it makes it painfully obvious that their plans are going to go awry. Nicholas Ray smartly keeps the editing fit and trim. You can feel the low budget in the heavy reliance on in-car conversations (poorly rear-projected), but the rapid pace, high action quotient and brief running time (82 minutes) help pick up the slack. The downside is that there are major shifts in setting and story (the reassignment north, the morning after arriving at the cabin), that abandon all the work on character and atmosphere previously expended. Subplots are left behind (like an extended period of attention bestowed on a fellow cop’s injured arm), opinions are changed with a disconcertingly blithe breeziness and sections have the discrete independence of a multi-act play. I admired the polar-desert photography in the second half, but the contrast with the poorly-shot, mismatched urban imagery from the first half ruins any visual unity. Even the outdoor chase through the northern countryside has some lame rear-projection, an obviously sped-up crash and some blatant cuts between different times of day (the shadows never match up). The indoor footage is mostly the typical ‘scary, wooden house’ type of thing one expects from horror movies, but with a warm romance sapping the tension away and rendering the under-decorated set mundane. Credit goes to Bernard Herrmann (better know from Hitchcock’s films) who provides an amazing score. The all-brass musical pieces are assertive and invigorating, but largely wasted on unexceptional car chases. Ultimately, “On Dangerous Ground” feels like less than the sum of its parts. As a straight-forward film noir with an original feel and emphasis on internal struggles over gangland gunfights and investigative procedure, the film will satisfy. However it never probes very deeply into Jim’s mind and presents too easy an out for his alienation. As for the visuals and filmcraft, Ray could have done better but the basic principles of his intended look and feel are interesting. 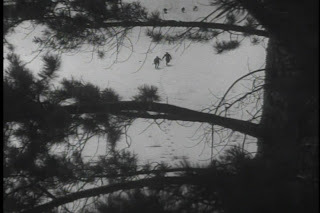 For a better Ray noir, try “In a Lonely Place” (1950) or look into his twisted inverted western “Johnny Guitar” (1954). Overly emotional moments using blind people feeling faces...what can one say? They just shouldn't use it...but they do. Argh. I can't think of any movie where I didn't cringe. It's a very intimate act, sure, but it always comes off looking cheese-tastic instead. Don't you just HATE it when movies feel like they go completely awry at the end? Spielberg is an extremely good example of this. 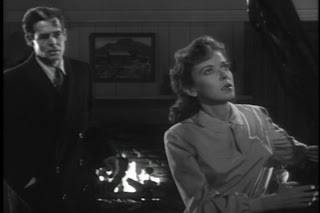 For the record, Nicholas Ray wanted a more open-ended and borderline pessimistic ending where Robert Ryan is spurned by Ida Lupino (like in the film) and returns to his city but with a newfound Zen feel--this type of ending was typical for the dark Ray. 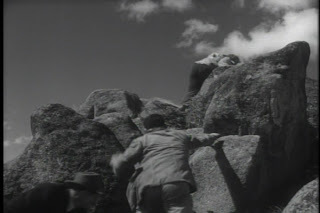 However, then-RKO owner Howard Hughes (yes, THAT Howard Hughes) forced Ray to film the happy ending that is seen in the final cut. So you can bash the ending all you want, but please know that it wasn't the director's fault. "One can’t help think that the studio (RKO) mandated the feel-good wrap-up." but I suppose I should have guessed that it would take someone of Hawk's stature to stand up to Ray. It must have been a bitter pill for him to swallow, since he rarely took orders without a fight. Yet even with a better ending, this isn't one of Ray's best nor one of noir's great masterpeices.